Nina Saunders, outgoing President of the KZN Institute for Architecture inducts Kevin Bingham as incoming President of the KZNIA. 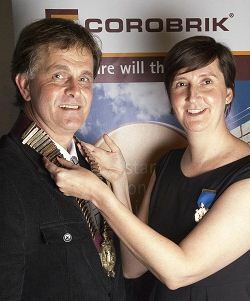 He was congratulated by outgoing president, Durban City Architect Nina Saunders, who said that she was comforted to be leaving the organisation in good hands and was assured that it would continue to grow and flourish under his leadership. The inauguration ceremony, sponsored by Corobrik, was combined with the official opening of the KZNIA publiCITY Exhibition in honour of the new president, which offered members the opportunity to present a favourite project of theirs for the public to view at the KZNSA Gallery until May 19. The publiCity exhibition will run concurrently with an exhibition of the work undertaken in Haiti by ARCHIVE Global, an international non-profit organisation using housing and environmental design to combat disease among the most disadvantaged. Peter Williams, the founder and executive director of Archive Global, was the guest speaker at the presidential inauguration ceremony. The KZNIA, founded in 1901, is one of the oldest architectural institutes in South Africa. Its aim is to connect and enrich the local architectural community, to foster a working environment in which they can pursue excellence and to provide a professional support system. The KZNIA presidency is ordinarily a two-year term of office and Bingham was elected to the position in October last year after many years of involvement with the organisation. He began serving on the Natal Institute of Architects (NIA) committee in 1992 and over the years has chaired or served on the institute’s youth, education and marketing committees before becoming a member of the KZNIA Executive Committee last year. The UIA has a membership of 1.3 million architects globally and holds the largest architectural congress tri-annually. The theme for the Durban event is ‘architecture otherwhere’. Bingham, a Northlands Old Boy, completed his Bachelor of Architecture degree at Natal University and his Master of Architecture degree at UKZN. His career has spanned the academic and private sector, taking him to many different countries and involving him in a variety of architectural projects. The relationship between AIDS and architecture, designing medical facilities and building for rural communities are strong interests of his and he has presented numerous papers and published articles on these subjects. Bingham has worked for a number of architectural firms in Durban and established his own practice in 1997. His current position is as director of FGG Architects. In the academic world he has been a lecturer at Durban’s two universities in subjects ranging from design, architectural acoustics, to building technology and was external examiner at the University of the Free State. On the international front he has taught architecture and interior design at Liverpool University in the UK and Queensland University of Technology in Australia. Married with two university-going sons, Bingham is a dedicated family man. Out of office hours he can be found at Durban’s Point Yacht Club where he is the Vice-Commodore or on the treadmill wondering how he can build on his tally of five Comrades marathon medals. KZNIA President – Kevin Bingham on 082 432 4354. Distributed by Shirley Williams Communications. Contact Shirley on 083 303 1663 or [email protected].